Causes: Industrial agriculture like intensive animal husbandry and intensive crop cultivation. Effects and trends: Since the 1950s and 1960s agriculture around the world has developed into a massive industry. 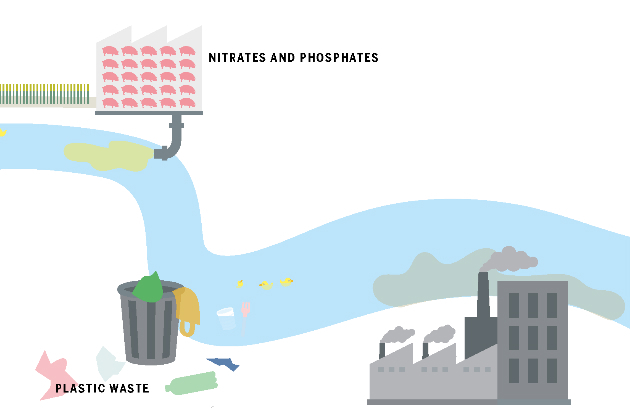 Discharges of animal manure and artificial fertilizer reach rivers via groundwater and end up in the ocean, resulting in dead zones off the coasts. 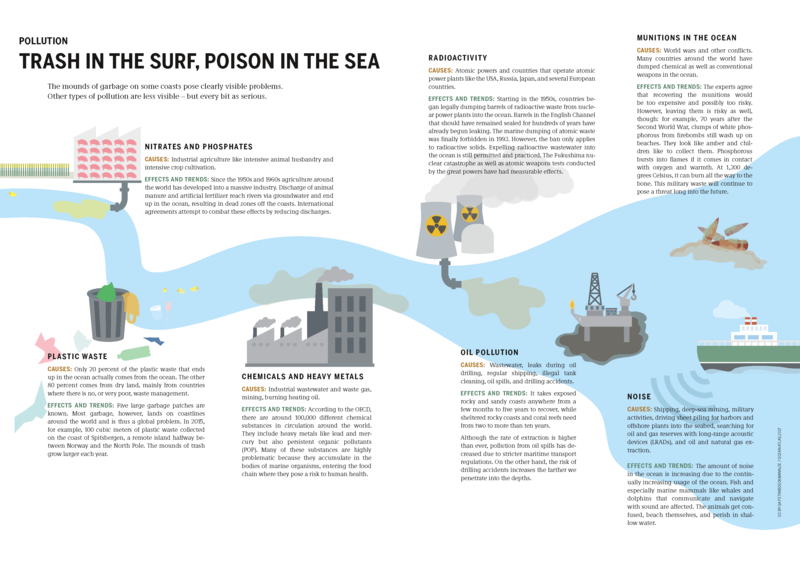 International agreements attempt to combat these effects by reducing discharges. Causes: Only 20 percent of the plastic waste that winds up in the ocean actually comes from the ocean. The other 80 percent comes from dry land, mainly from countries where there is no, or very poor, waste management. Effects and trends: Five large garbage patches are known. Most garbage, however, lands on coastlines around the world and is thus a global problem. In 2015, for example, 100 cubic meters of plastic waste collected on the coast of Spitsbergen, a remote island halfway between Norway and the North Pole. The mounds of trash grow larger each year. Causes: Industrial wastewater and waste gas, mining, burning heating oil. Effects and trends: According to the OECD, there are around 100,000 different chemical substances in circulation around the world. They include heavy metals like lead and mercury, but also persistent organic pollutants (POP). Many of these substances are highly problematic because they accumulate in the bodies of marine organisms, entering the food chain where they pose a risk to human health. Causes: Atomic powers and countries that operate atomic power plants like the USA, Russia, Japan, and several European countries. Effects and trends: Starting in the 1950s, countries began legally dumping barrels of radioactive waste from their nuclear power plants into the ocean. Barrels in the English Channel that should have remained sealed for hundreds of years have already begun leaking. The marine dumping of atomic waste was finally forbidden in 1993. However, the ban only applies to radioactive solids. Expelling radioactive wastewater into the ocean is still permitted and practiced. The Fukushima nuclear catastrophe as well as atomic weapons tests conducted by the great powers have had measurable effects. Causes: World wars and other conflicts. Many countries around the world have dumped chemical as well as conventional weapons in the ocean. Effects and trends: The unanimous opinion of the powers that be is that recovering the munitions would be too expensive and possibly too risky. Leaving them where they are is risky as well, though: for example, 70 years after the Second World War, clumps of white phosphorous from firebombs still wash up on beaches. They look like amber and children like to collect them. Phosphorous bursts into flames if it comes in contact with oxygen and warmth. At 1,300 degrees Celsius, it can burn all the way to the bone. This military waste will continue to pose a threat long into the future. Causes: Wastewater, leaks during oil drilling, regular shipping, illegal tank cleaning, oil spills, and drilling accidents. Effects and trends: It takes exposed rocky and sandy coasts anywhere from a few months to five years to recover, while sheltered rocky coasts and coral reefs need from two to more than ten years. Although the rate of extraction is higher than ever, pollution from oil spills has decreased due to stricter maritime transport regulations. On the other hand, the risk of drilling accidents increases the further we penetrate into the depths. Causes: Shipping, deep-sea mining, military activities, driving sheet piling for harbors and offshore plants into the seabed, searching for oil and gas reserves with long-range acoustic devices (LRADs), and oil and natural gas extraction. Effects and trends: The amount of noise in the ocean is increasing due to the continually increasing usage of the ocean. Fish and especially marine mammals like whales and dolphins that communicate and navigate with sound are affected. The animals get confused, beach themselves, and perish in shallow water.